This Guinness t-shirt is available at The Irish Gift House in limited sizes. Ireland's coat of arms has received an upgrade with an added pint of Guinness on the back of this green Guinness t-shirt. The coat of arms design is enhanced with Guinness and Dublin Ireland along with shamrocks and the date of 1759, the year the famous brewery at St. James' Gate opened. The front of this Irish t-shirt features the Guinness trademark logo across the chest. 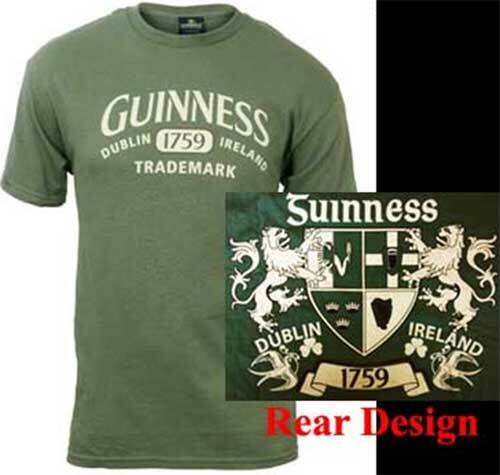 This double sided Guinness t-shirt is Army green in color and it is 100% pre-shrunk cotton.